The surviving members of Motorhead are regrouping for an upcoming tribute to late band leader Lemmy. Phil Campbell has confirmed there are plans to put the group back together for a series of concerts with special guests filling in for the Ace of Spades singer. "It's on the cards, but it's just gonna be a few select shows," the guitarist told Rock Talk With Mitch Lafon. "We're not gonna be touring with it. We're gonna get these people involved... and we'll just do some special shows worldwide, which will be good - a tribute to Lem and to the band maybe, but it wouldn't be an ongoing thing. "Everyone's too busy, but (we want to) do something special. We're still trying to work on that now." 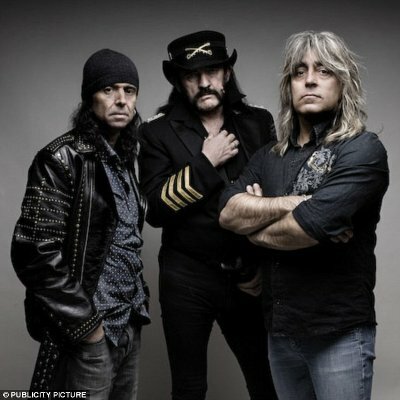 Campbell's comments will be good news for Motorhead fans after drummer Mikkey Dee declared the band would be no more following Lemmy's death in December, 2015. "Motorhead is over, of course," he told Sweden's Expressen newspaper. "Lemmy was Motorhead. We won't be doing any more tours or anything. And there won't be any more records. But the brand survives, and Lemmy lives on in the hearts of everyone." Meanwhile, Campbell has also updated fans on the status of his upcoming solo album, which will feature guest appearances by rock royalty Rob Halford, Matt Sorum, Dee Snider, and Joe Satriani. "I'm gonna try to get my solo record out in 2018," he told Lafon. "It's like 60, 70 per cent done. I had to put that on the shelf... but I'm gonna try for this year. Hopefully it will surprise people." He's also working on a book, but admits he's nervous about writing about his pal and bandmate Lemmy. "I stopped the book," he added. "I'm not sure if I wanna do it anymore. I think some things should remain private. I can't really decide at the moment. But there's a lot of funny stuff which people would enjoy, so I'm torn at the moment."